Launching onto the world stage after an incredibly successful run on the Nickelodeon show, Victorious, she is quickly gaining fans around the world with her solo music career. She has quite the following in Japan too, with her most recent album, My Everything, peaking at #3 on the weekly Oricon Music charts. And while Japan can’t get enough of her songs and her extremely long hair (extensions), there is something else that her Japanese fans are talking about these days: Ariana Grande is learning hiragana. And having been to Japan many times herself, Ariana Grande is very familiar with the concept of “kawaii.” In fact she’s quite fond of Japan, proudly claiming on Japanese TV that she loves edamame, tofu and the eclectic Japanese singer, Kyary Pamyu Pamyu. 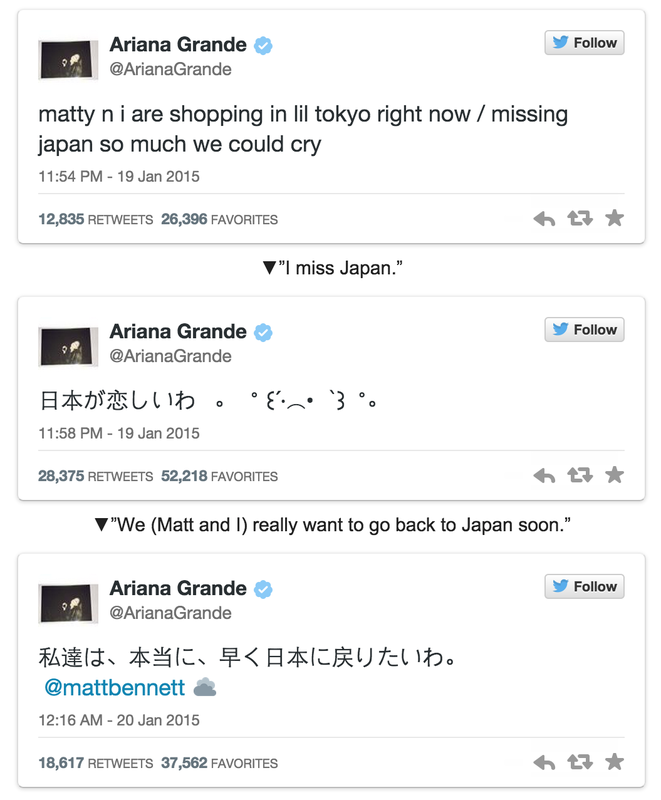 And Ariana Grande is making sure her fans know that her love of Japan extends beyond her screaming Arianators. Her recent Instagram post conclusively separates her from all the other young female singers from America. ARIANA IS STUDYING JAPANESE!!! 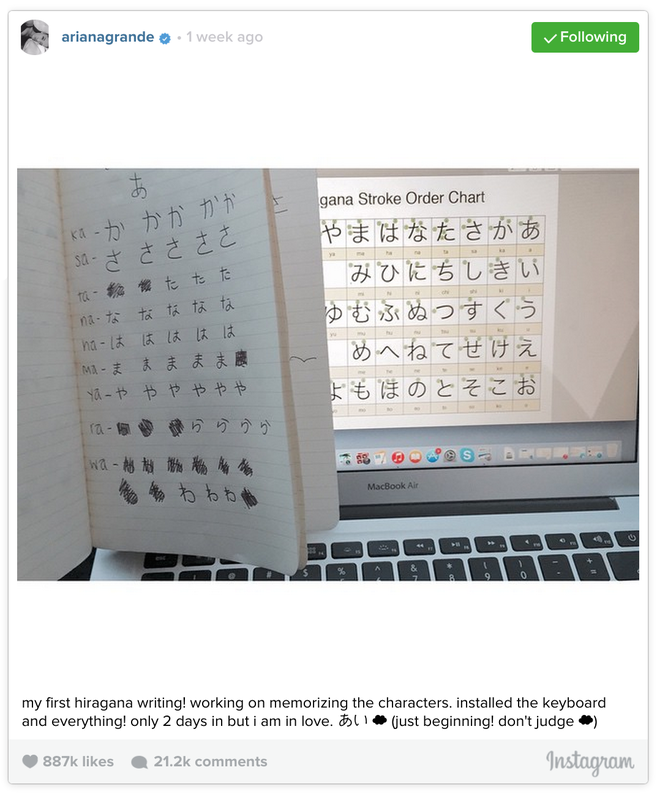 Countless news outlets and fans have written about how she is studying Japanese since that pictured was posted. She seems dedicated to her studies as well, having downloaded a Japanese keyboard on her phone. But, whether she is seriously studying Japanese during her busy schedule or just taking a swing at learning hiragana, her Japanese fans can’t get enough of it. Ariana Grande has definitely captured the hearts of her Japanese fans, and she assures them that she will be back in Japan soon. 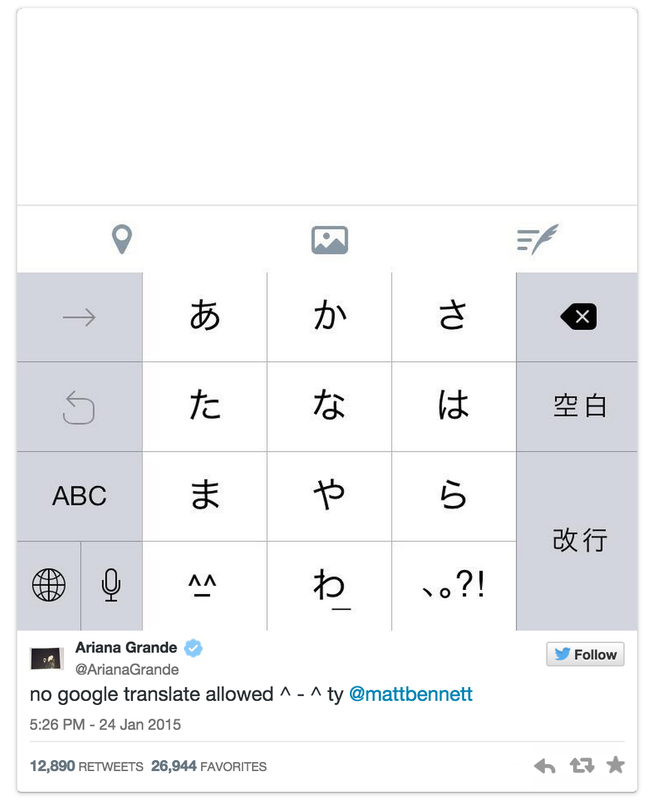 Who knows how far Ariana’s foray into the Japanese language will go. Perhaps she will surprise her fans with a homemade handwritten sign professing her love for Japan at her next concert. 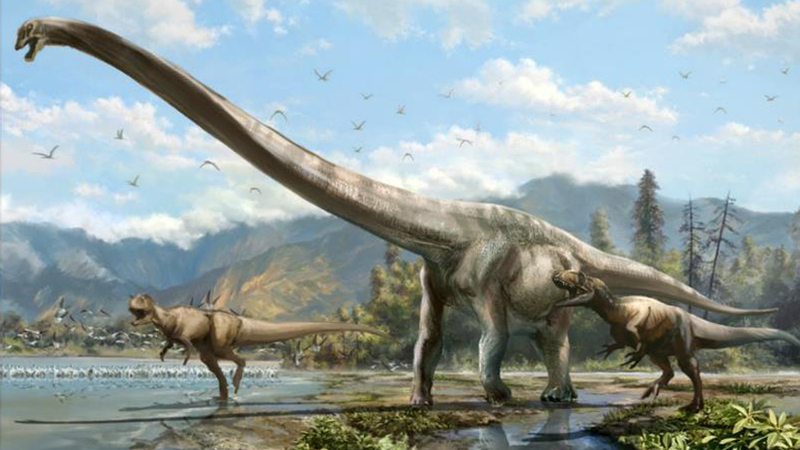 Artist’s conception of Qijianglong, chased by two carnivorous dinosaurs in southern China 160 million years ago. Dubbed the Qijianglong (“dragon of Quijang”), the sauropod has a neck that measures 25 feet long, virtually half of its body length. “As far as I know, there are no more bones in the field of this dinosaur,” said team leader Phillip Currie of the University of Alberta. Some researchers believe that mamenchisaurs were unable to migrate due to the sea barrier, and lost in competition when invading species arrived once the land connection was restored. He might not be far off: in 300 BC, the historian Chang Qu documented discovering “dragon bones” in Sichuan, which Quijang is a province of. Garlic flavored cola. Just let that sink in for a moment. Fizzy sweet cola with a pungent garlic taste. Yum? Over the years, we’ve seen a lot of weird food and drink come out of Japan, and as of January 9, there has been a new addition to that list. Hailing from Aomori, the garlic capital of Japan, which has previously produced such delectables as garlic ice cream and garlic beer, “Jats Takkola,” is brought to us from the garlic center of the garlic capital of Japan, also known as “Garlic Town,” Sannohe Districts’ Takko Town. The town got its charming nickname from the fact that every July, so much garlic is harvested that the entire town, home to almost 6,000 people, smells of the pungent bulb. We have a feeling they don’t suffer from vampire attacks very often. The town offers pretty much any form of garlic you could ever imagine, but the creation of the Takkola (get it? Takko + cola = takkola), took some trial and error experimentation. The real issue, apparently, was breaking through the stereotype that garlic should be used exclusively for food. ▼ Don’t you just want to plop a bulb of garlic in your next cup of Coke? The drink is just cola mixed with some finely ground garlic, pretty simple. It’s just as bubbly and tasty as normal cola, but you get the pleasant aftertaste of garlic. Who wouldn’t love that?! Really, if you think about it, it’s probably not much different than washing down some garlicky gyoza with cola and then burping. You just don’t have to eat the gyoza first. Since the name of the drink doesn’t mention garlic at all, this could easily be used to play some tricks on unassuming friends who don’t know that Takko is the garlic center of Japan. Then there is also the fact that “Jats!” is local dialect for what you say when you are surprised, an odd feature for the name of a cola. That is, unless the creators of this drink had some tomfoolery in mind when they made it! ▼ The garlic clove on the label could go unnoticed to the unobservant. In reality, they chose the name because they want this item to leave a lasting impression and to “stimulate the heart” of whoever sips it. They advise that before you drink, turn it slowly to remix the garlic, open the cap carefully and then take a sip. According to the creators, there is no way that you won’t shout in surprise after tasting it. So, if you’re itching to play tricks on friends, are just really scared of vampires, or are looking for a health-boosting cola, you can order a case of 24 bottles from the town’s merchandise website, for 7,200 yen (US$60) or if you’re in the area, head to the store itself where you can get single bottles for 299 yen (US$2.50) each, until the end of February. 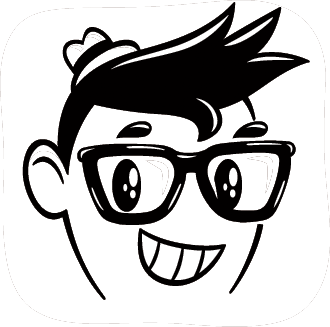 Also, please, if you do use it to play tricks on your friends, sneak a video and share it with us! You might not guess it, given the country’s well-known acceptance of stoicism as an admirable virtue, but Japan absolutely loves puns. In fact, the characteristics of the Japanese language, such as multiple potential pronunciations for the same kanji character, make it a veritable pun-producing machine. Of course, that also means bei is pronounced like the first half of Baymax, the loveable caretaker/combat robot from Disney’s Big Hero 6. 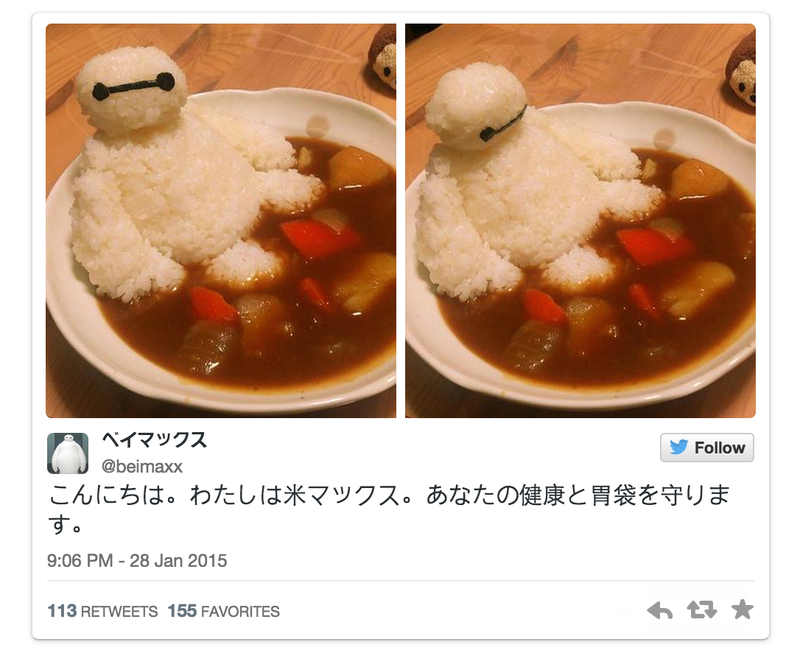 And now that Japanese fans of the film have figured out how to put a little rice into Baymax, they’re also coming up with ways to put a little Baymax into their meals by making Baymax curry rice, rice balls, and nabe hot pots. You can thank pop idol Haruna Kojima for kicking off the culinary trend. Earlier this month, the AKB48 member found herself with some extra time on her hands, so rather than make a plain old plate of curry rice, she decided to shape the fluffy white grains into a likeness of Baymax, adding two small, connected circles of dried seaweed to recreate his simple facial expression. 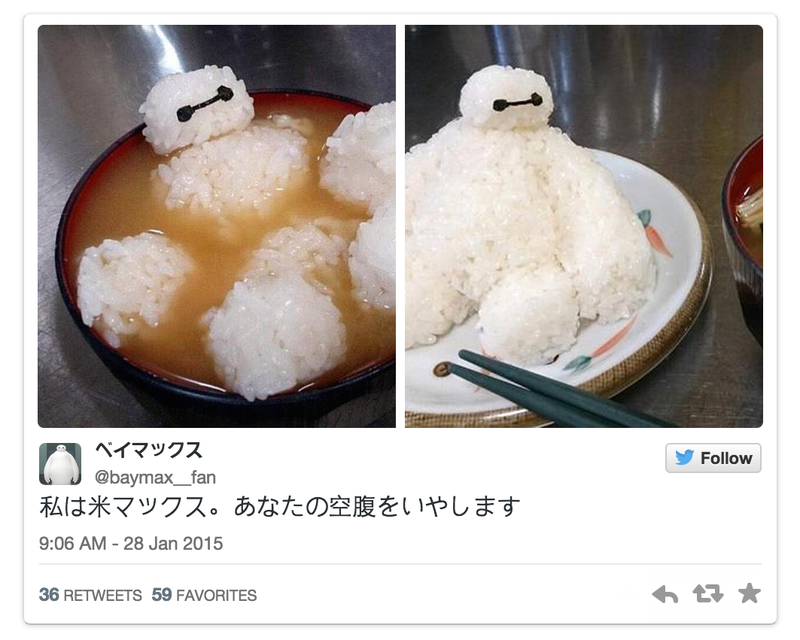 Identifying her creation as Baymax, but written with the kanji for rice, Kojima posted the above photo to her Instagram account, where it put smiles on the faces and rumbles in the stomachs of all who gazed upon its appetite-stimulating cuteness. Even better, in contrast to the difficulty in trying to craft an edible version of Pokémon’s Pikachu or Yo-Kai Watch’s Jibanyan, Baymax’s soft, simple form and almost entirely white color scheme means that just about everyone can manage this cooking project, as proven by the steady stream of Rice-max photos that have been popping up since. Even six weeks after its release, Big Hero 6 is still going strong in Japan, wherepositive word of mouth about the films variety of action, comedy, and heartfelt emotion made it the highest-grossing movie in the country last weekend, just like it was for the three weekends before that. It’s a testament to the film’s broad appeal that stretches beyond just the kiddie demographic, and includes fans old enough to enjoy a little alcoholic refreshment with their Baymax curry. Of course, Japan has a lot more ways to eat rice than just covering it with curry roux. 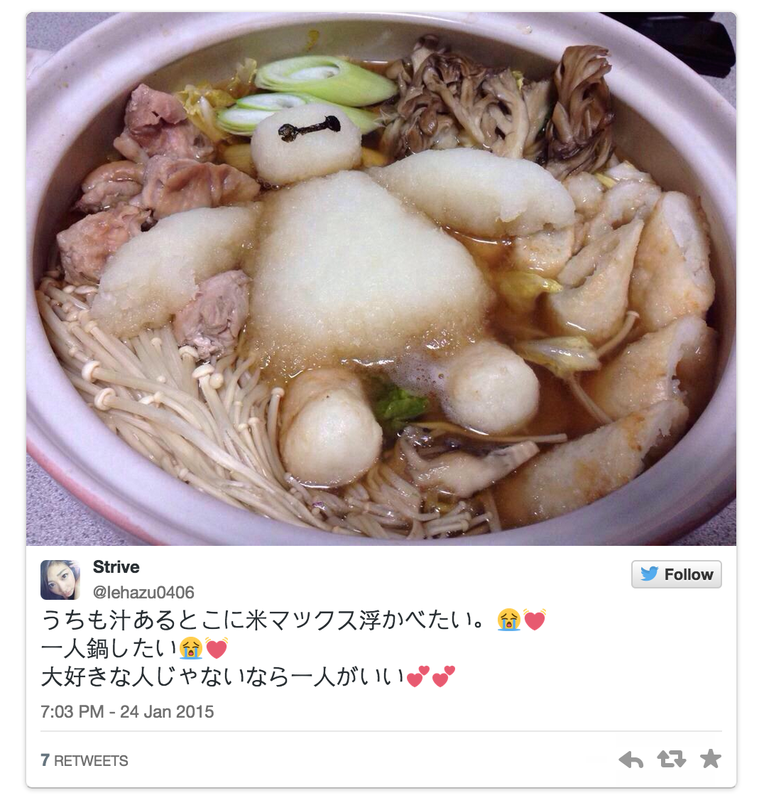 How about a Baymax oyako-don, a rice bowl with chicken, egg, and the cuddly robot? If you’re after even lighter fare, you can combine rice and miso soup, which is also a great way to make use of leftovers of the two Japanese staples. It’s also worth bearing in mind that the rice/bei/Baymax pun still holds up even if you’re not using plain white rice. For example, mochi (rice cakes) are just as appropriate for adding a dash of Disney to your hot pot. Renowned Japanese clothing label SOPHNET. has released its 2015 spring/summer collection. This season’s offerings maintain the brand’s ethos of sophisticated daily wear with a minimalist approach by implementing basic motifs and patchwork onto traditional items. The collection is now available at SOPHNET. shops across Japan and select accounts. It looks like Marvel superheroes can exist in the real world after all. Citizens of San Francisco can now see Ms. Marvel, a Pakistani American Muslim teen named Kamala Khan, fighting against racism. How exactly is she doing this? By fighting back against Anti-Islam bus ads. It all began when the American Freedom Defense Initiative, a group that is sometimes classified as an extremist anti-Muslim hate group, purchased some offensive bus ads which correlated Muslims to Nazis. You may be wondering why these ads weren’t taken down immediately. Apparently, despite countless complaints from the public, the San Francisco Municipal Transportation Agency (Muni) could not take the ads down because of freedom of speech. In fact, Muni is even running it’s own campaign against the ads. This brilliant response even caught the attention of G. Willow Wilson, the creator of Ms. Marvel. So who says superheroes can’t exist in the real world? Ms. Marvel is certainly doing a good job with it. Never heard of Fred Korematsu before? Well today may just be the perfect day to learn about him. After all, January 30th is proclaimed Fred Korematsu Day. Unfortunately, he often flies under the radar because his story is still one that barely receives recognition in your average American history lesson. In fact, Korematsu Day is only recognized by the states of California, Hawaii and Utah. During World War II, President Roosevelt signed the Executive Order 9066 which made it legal to incarcerate Japanese Americans and anyone of Japanese descent into concentration camps, and Korematsu’s family fell victim to the legal discrimination. But Korematsu defied the president’s order believing he was an American citizen, and saw the situation for what it was — an injustice. In an effort to avoid the unjust discrimination, Korematsu got minor surgery to alter his eyes, changed his name to Clyde Sarah and even claimed his ancestry as Hawaiian and Spanish. However, his efforts were foiled when he was arrested and convicted in federal court for violating the government orders. “According to the Supreme Court decision regarding my case, being an American citizen was not enough. They say you have to look like one, otherwise they say you can’t tell a difference between a loyal and a disloyal American,” said Korematsu. It wasn’t until years later, in 1983, when Judge Marilyn Hall Patel of the U.S. District Court of Northern California in San Francisco formally overturned the conviction of Korematsu that his innocence was acknowledged. It was a pivotal moment in U.S. civil rights history, especially because Korematsu would never forget these injustices. In fact, he decided to make sure America wouldn’t forget these injustices either. Why is his story important? Because it serves as a reminder for Asian Americans that we are still very much human and we deserve our human rights like any other American. If you feel that Fred Korematsu’s history deserves to be highlighted, 18 Million Rising is holding an online petition to have Korematsu featured as a Google Doodle. They’re 200 letters away from reaching their goal! For more about Fred Korematsu click here, and you can send in your letter to Google here.